Most visitors arriving in Prague know roughly what they can expect to find – beautiful buildings, squares, parks, galleries and museums but what about the food? Many still have an old fashioned view of what may be on offer in the gastronimic establishments in the city. The truth is that like in any cosmopolitan city you can find all manner of cuisine from Chinese or Thai to Greek or Icelandic, in addition to the ubiquitous fast food outlets represented by the Colonal or the Golden Arches. But when in Rome..................... why not go Czech? Firstly, it should be mentioned that Czech cuisine doesn’t exactly win points in the healthy eating stakes, but it is good solid food which most people find extremely pleasing on the palate if not on the stomach or thighs – hopefully all that walking you do whilst you’re there will counterbalance the calories! A typical Czech meal will feature soup, a main dish (usually meat with a side order of potatoes or dumplings) and a pudding, washed down,of course, with some pleasingly cheap Czech beer or wine. These will arrive very quickly unlike the meals on the other section of the menu (minutky) which are cooked to order. 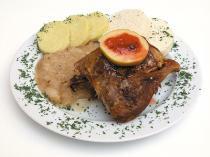 For the main course the most popular meat is chicken (kuře) or pork (vepřové). Fish is less common although you can find trout (pstruh) and salmon (losos) on most menus. You will usually have to order the carbohydrate part of the meal as a side order (priholy) . You will probably find a staggering number of potato forms ( boiled = vařené, mashed = kaše, wedges = Americké), along with the traditional potato salad (bramborový salat), dumplings (knedliky) and rice (rýže). In most Czech restaurants there won’t be a huge selection of vegetables although you usually find broccoli (brokolice) as a side order and also a plate of mixed vegetables. 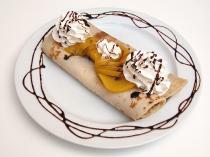 Among the most typical desserts are crepes (palačinky) filled with fruit and topped with whipped cream (šlehacka), koláče (sweet pastry with various fillings) and apple strudel (jablečný závin). Ice cream is always an option and gives you the chance to say one of the most pleasing Czech words – Zmrzlina! 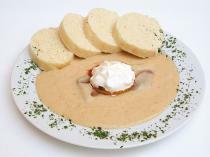 (ice cream)ore.
Svickova (often served at weddings) consists of roast tenderloin in a cream sauce topped with sour cream and cranberry relish served with potato dumplings. Duck and Dumplings – need we say more?! 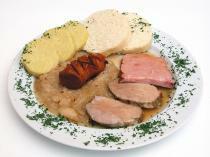 Knedlo, zelo, vepřo (roast pork served with sauerkraut and dumplings). Omlettes – with cheese (syrova omeleta), mushrooms (omeleta se zampiony) or peas (omeleta s hraskem). Fried Cauliflower (Smažený květák ) and breaded mushrooms (smažené žampiony) both usually served with tartar sauce. Tartar sauce is far more common than tomato ketchup but all restaurants have it – you’ll just have to ask!! Finally.............Remember to tip at the end of the meal by rounding up the amount to a suitable figure. In most restaurants the waiter will give you the bill, you will round it up quickly and tell him the rounded up number as you hand over the money. In some posher restaurants the bill wil come in a wallet it is then customary to pay the amount given and leave the tip in the walet when you leave. Check the bill to make sure that you haven’t been ripped off – you will probably find that there are small charges for bread etc..
Don’t forget to wish eachother ‘Bon Appetit ‘ before you eat – or as the Czechs say...........Dobrou Chuť! !